Ludwig van Beethoven had music in his blood. A grandson of another famous musician of the time, he was expected from birth to follow in his famous grandad’s footsteps. Beethoven learned music from his father before going on to train formally with 3 teachers, an organist, a violinist and a pianist. One of his teachers was well-known to have insomnia-like symptoms. He would drag young Beethoven out of bed in the middle of the night to practice. His training was brutal by today’s standards. All day, and sometimes all night, he spent practicing. But Beethoven went on to produce some of the most world-renowned and appreciated musical compositions of all time. He also began to develop hearing loss in his 20’s. By 46, his hearing was completely gone with no technologies to restore it. While the cause of Beethoven’s deafness is debated, passion for music is a common cause for hearing loss. Luckily, musicians today don’t have to make that sacrifice. Professional musicians are 4X more likely to develop noise-induced hearing loss, which is irreversible. They’re also nearly 60% more likely to develop tinnitus–ringing in the ears or other noises. 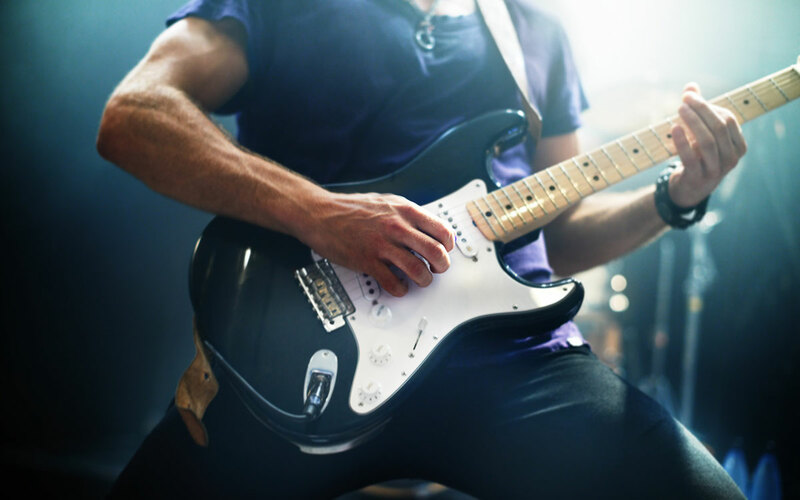 Even if a concert itself is only a couple hours, a rock musician may spend hours a week practicing at home and recording in a studio. A typical rock concert can exceed 120 decibels. That’s enough to cause permanent damage instantly. Add to this the practice time which may be at 80-90 decibels for an extended period of time. If music is your life and you’re not protecting your ears, losing your hearing at a younger age is almost an inevitability. Classical musicians aren’t immune. They’re exposed to volumes even louder. Sitting in an orchestra right next to the trumpet or violin section can spell disaster for professional musicians. Prolonged exposure to 80 decibels can cause hearing loss. 80 decibels is roughly the volume of someone yelling loudly. A dial tone is around 85 decibels. Most music is louder than either of these even in the practice room. Yes, your own body produces chemicals that can damage hearing when combined with noise, and can make your hearing decline rapidly. Even today, classical music is well-known for its highly competitive and stressful work environment. You often practice 4 or more hours every day. The stress and extended practice times together may explain why classical musicians suffer at rates even higher than those in other genres. Because hearing loss is gradual, many musicians cope with it longer than they should. Musicians are often adept at reading lips because of a need to communicate in very loud settings. Professional musicians should get a hearing test at least annually to track any damage. Discussing hearing loss prevention strategies with a hearing specialist is essential. What Hearing Protection Is Best for Musicians? Prevention is key. Modern technology has made possible earplugs specifically designed for musicians. These are often customized to both the musician’s ear shape and the instruments they practice with the most. These earplugs lower the volume without disrupting the complexity of the music and voices you need to hear to do your job. Unlike standard earplugs, musician earplugs can reduce volume by as little as 9 decibels. So you never have to feel you’re sacrificing your connection to the music or risk not being able to hear stage instructions. Hearing protection for musicians are also often clear so you don’t have orange foam sticking out the sides of your ears. If you have already suffered from hearing loss, don’t cope with it. Untreated hearing loss advances more quickly. It may impact your ability to live your dream as a professional musician sooner than you think. Hearing aid companies and hearing specialists alike work very closely with musicians. They understand how complex music is. They know how important hearing is to a professional musician. In recent years, hearing aids that specifically address musician needs have been, and continue to be, developed. Don’t wait to get your hearing tested. Discuss solutions with a hearing professional.